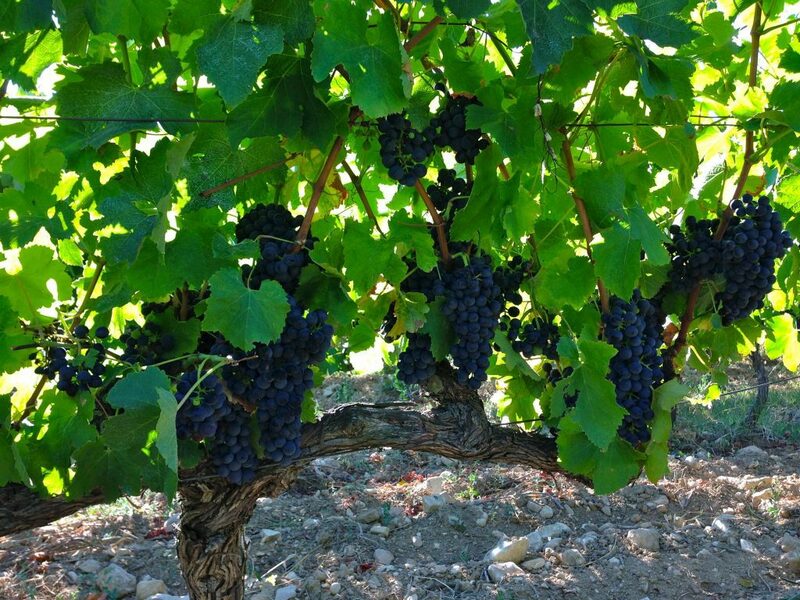 These grapes are on a Cru Vinsobres Syrah vine and they certainly look nice and ripe, but we are still two or three weeks away from harvest. As it’s the first of September we wanted to get a slightly better idea of exactly where we are and thus when harvest might be. Therefore, as well as a visual inspection (principally looking at the colour of the stalks and the pips) and a tasting (how chewy are the tannins in the skins) I did a field reading for the sugar levels. To do this you take a sample of individual berries from across the plot (a freezer bag is good for collecting them) and then crush them to release the juice. I then take a few drops and take a reading of the sugar content with a handheld refractometer. We are at 10.2% potential alcohol on the Cru Vinsobres Syrah (which is virtually always our first plot to harvest). I think this year we will probably be aiming to harvest at around 12.5% (although much also depends on the ripeness of the tannins) so we are a little way off. The vines gained about 1.5% last week, but even though the weather is forecast to stay hot and sunny they are unlikely to maintain this rate of increase. Nevertheless I suspect we are looking at harvesting these plots a few days after the 15th. This won’t be as late (compared to last year) as we thought a few weeks ago, principally because of the amazing spell of hot and sunny late summer weather we have been enjoying for the last two or three weeks. We’ll do some testing on the Grenache in the next few days to give us a baseline for that too, so check back soon for an update.